MISSION, KS--(Marketwired - May 19, 2014) - (Family Features) When it comes to teaching kids about healthy eating habits, there's no better classroom than the kitchen. From conceiving recipes to measuring, pouring and mixing, helping out in the kitchen is not only fun, it gets kids interested in trying new and healthy foods that they may otherwise push to the edge of their plates. So when you're searching for delicious, nutrient-rich and kid-friendly recipes to make together as a family, get inspired by the wonderful canned foods in your pantry. Many of us have long relied on canned foods because they're affordable and convenient, but they're so much more. Many canned fruits and vegetables are just as, if not more, nutritious than their fresh or frozen counterparts. In fact, according to a recent study using data from the NPD Group's Food Impact Profile, adults and kids who eat more canned foods have healthier diets and are more likely to meet or exceed their recommended daily allowance for 17 essential nutrients. Since the canning process locks in foods' nutrients at the peak of ripeness, all of the freshness, flavor and goodness are naturally sealed in. And by having different varieties of canned produce on hand, you have year-round access to healthy recipes that feature your favorite fruits and vegetables. With canned food staples like protein-packed black beans, hearty chicken and vitamin C-rich peaches, easy and nutritious homemade meals are just a few cans away. And with approachable recipes like Chicken Tacos with Peach Salsa and Mexican Fiesta Dip -- which makes a terrific snack -- it's easy for the kids to get involved. They'll be so proud of themselves for helping, and you'll feel good knowing that you provided them with a healthy meal. For more healthy recipes and to learn how you and your family can get cooking with canned foods this season and year round, visit www.CansGetYouCooking.com. To prepare salsa, in medium bowl combine chopped peaches, green chilies, red onion, parsley, lime juice and Tabasco sauce. Cover and refrigerate until ready to serve. 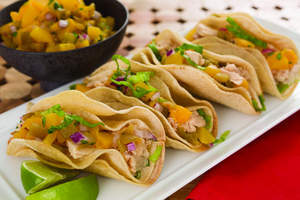 To prepare tacos, fill tortillas with flaked chicken; top with peach salsa. Serve with shredded cabbage and cheese if desired. Garnish with lime wedges if desired. Note: Canned tuna can be substituted for chicken.